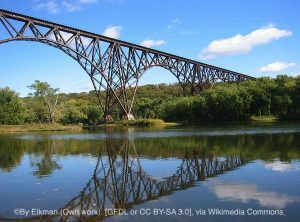 History: The Arcola Trail Bridge is an old railroad bridge that crosses over the St. Croix River. The bridge itself has become a fascination for many of the locals. People have called it the “High Bridge” (while this title may seem facetious because of its low clearance from Arcola Trail, it means that it spans high over the St. Croix River) to accentuate the danger of the bridge to pedestrians. Throughout its history, several people have been killed while walking on the bridge. To this day the bridge is still an operating railroad bridge and has no railings. 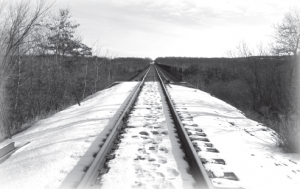 Many people have walked out onto the bridge for the views, thinking that the tracks looked too old and dilapidated to still be in use, and have been surprised by an oncoming train. At that point they have to decide to die by jumping off the bridge into the water or to die by getting hit by the train. Most have chosen to jump. Once a young man was on the tracks and had to face this very same decision. He jumped from the bridge and was never found. His girlfriend went back to the tracks for years after the event, hoping to find her boyfriend. The Ghost Story: The bridge itself is haunted by a woman in white. Often at night, people near the bridge encounter what appears to be a young woman in a white dress walking up and down the train tracks. She has been spotted as far east as the Arcola Trail overpass and as far west as the span crossing the St. Croix River. When she is seen, she never seems to notice the onlookers. She simply walks further down the tracks and sometimes disappears into the night. Many say this woman in white is the girlfriend of the man who fell into the river, and that she is still looking for her lost love. Sometimes the ghost is carrying a blue lantern in her search for her lost love. Witnesses either see the woman in white or a blue light traveling up and down the tracks at night. The apparitions always eventually dim and fade into the night. Visiting: Arcola Trail North is open to traffic throughout the night. As long as you are not obstructing traffic, you can stop your car under the bridge and watch for the ghost of the mysterious woman in white. The road is rather remote, so it can get very dark and very quiet. This all adds to the creepiness of the place and many times will make this a fun spot to spend a night ghost hunting. 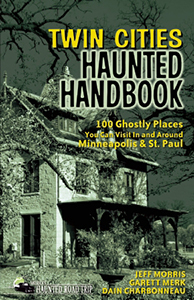 More recently, this has become a popular spot for teenagers to go to get scared and to fool around. As a result of this, police patrol this road rather frequently. If your car is stopped near the bridge and the police catch you there, they will ask you to leave. If you have stepped out of your car and attempted to walk out onto the bridge, you will be arrested. Directions: From St. Paul, take I-35E North for about 4 miles to exit 111A, MN-36 East towards Stillwater. Follow MN-36 East for almost 12 miles before turning left onto Manning Avenue North. Follow Manning for about 3 miles and then turn right onto Dellwood Road North. After another mile and a half, turn left onto Stonebridge Trail North. After another 3.5 miles, turn right onto Partridge Road North and then make an immediate left onto St. Croix Trail North. Follow St. Croix Trail North for a little more than 2 miles and then turn right onto Arcola Trail North. The bridge is a railroad bridge a little more than a mile down the road that passes over Arcola Trail North.